← I Still Can’t Believe They Print This Stuff! The boys spend most of the day playing outside while Husband loaded up our trusty trailer with bark and yard debris. Later in the day we ran a simple errand or two. We had a nice dinner of salmon, veggies, and rice on the back deck and after eating Carter went to check on our garden. He discovered that our summer squash is growing and was eager for us all to take a peek. We all wandered up to the garden to have a look. Sure enough our neglected and rather sad little garden was coming to life. Husband put Cody in charge of watering the parched plants, for which I am sure they were all quite thankful. The dishes are in the dishwasher and the boys will be getting ready for bed soon. It is very nice to have our little family back together again after this past week of Carter visiting his Grandma. 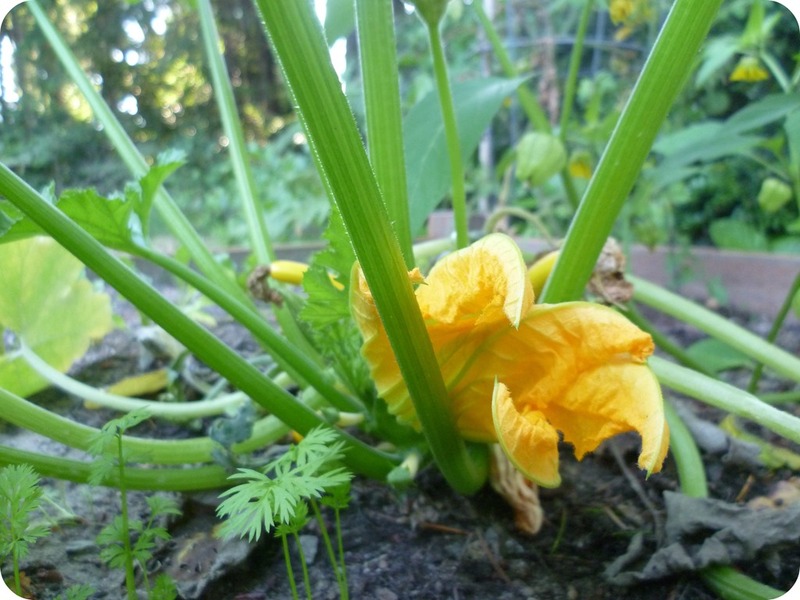 This entry was posted in Simple Sunday and tagged Children, Family, Garden, Home, Kids, Language Arts, Outdoors, School, Summer squash. Bookmark the permalink. Thanks. I am a bit of a word dork so I thought it was pretty clever, I hope my professors think so as well. These days I feel like all I get to see of my family are those little visits that I sometimes share with you here. Carter was so thrilled to show off the garden – I am glad he takes such an interest in it and I hope, like your son, he never looses it. This is our third year at attempting to grow squash. It seems as though everyone else who plants squash has it coming out their ears and we can’t seem to get even a single squash. 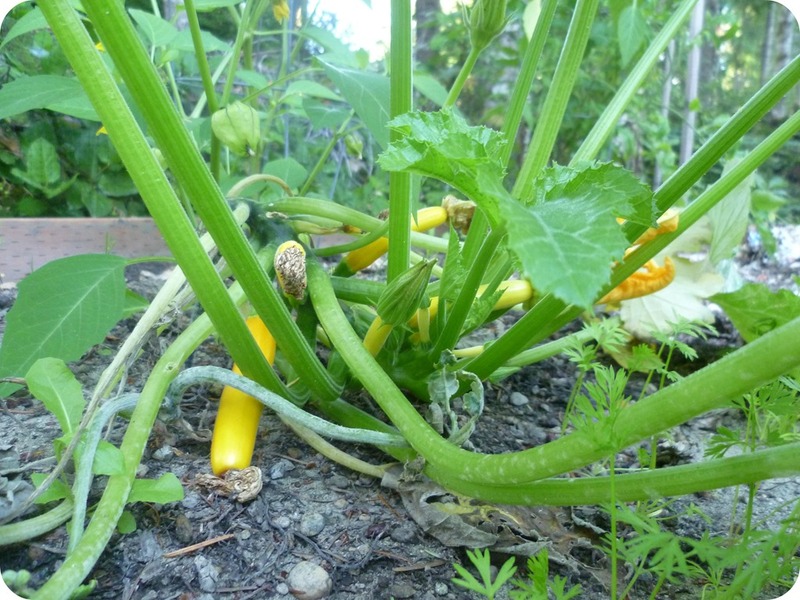 Our tomatoes and peas do well but I do not have the magic touch when it comes to squash – until this year! I like your description of a garden having a life of its own, so true and so wonderful that we get to experience it and enjoy the goodness that comes out of it. I keep saying I’m going to plant a garden, but I don’t. Maybe next year. I’m glad you are seeing the fruits of your labor. 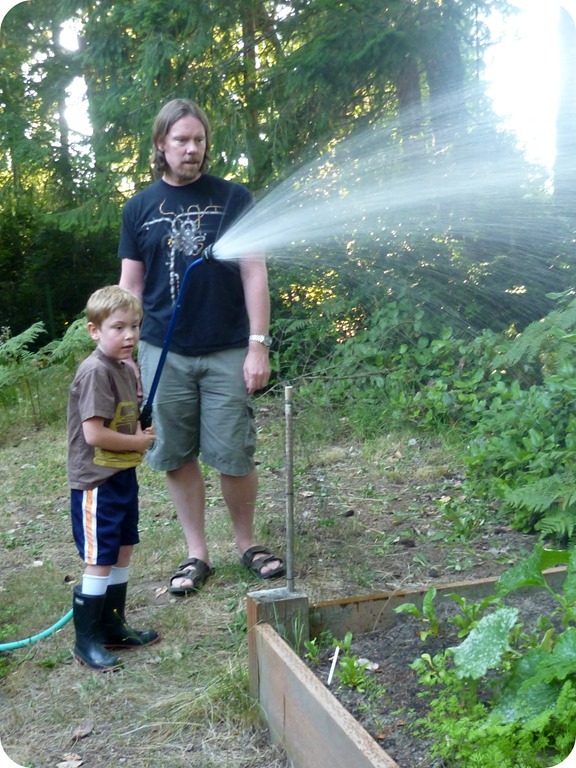 It’s great to see your husband and child in the garden, in such a pastoral scene. How wonderful it must be to dine on the food you’ve grown yourselves.